But given the inexpert deposit of excess solder I left the last time it's possible the failure was internal or further under the board. I decided to attempt to replace the capacitor again anyway. Unfortunately two attempts to replace it failed, largely due to my incompetent soldering skills, I suspect. Tinning the soldering iron tip proved unusually problematic this time. So I cleaned it with wire wool before the second attempt (and after it had cooled completely to room temperature). Note that you need to be really careful with this not to strip the iron surface bare or you'll find yourself in need of a new soldering iron. 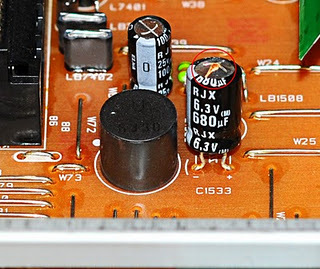 As I said before, though, if you're thinking of tackling something like this, especially if you are an infrequent actor in such an arena, be sure to snip the legs of the failed capacitor quite high up on the first pass, so that you have a solid base to crimp the legs of the new capacitor to before soldering. My original failure to do this meant successive replacements over the years have been increasingly difficult to crimp/graft and solder. I seem now to have reached the point of no return, at least as far as my rusty engineering repair skills are concerned. I blame middle aged eye-sight and the need for reading glasses for close up work too. It's probably just as well I don't have to build flight simulation rigs any more, though I'm pretty sure I could still do the mathematics, the modelling, the design and the testing the parts of aircraft to destruction bit - operating the rigs and running the tests was never as tricky as constructing them. I hope the next recorder finding it's way into the B2fxxx household has a long but less eventful existence. Well, our Virgin Media broadband connection was down again yesterday. It had apparently been playing up all morning but their was significant angst in the Corrigan household when I got back from my cycle circuit about 10.30am. Connectivity had been erratic but now there was no connecting to anything despite the lights on the hub suggesting it was getting a signal. And despite multiple modem re-boots. So I phoned the local principle Virgin Media engineer, Jacob, who had asked me to call him as and when we experienced connection problems. On speaking to him, I immediately felt guilty because it turns out it was his day off. He nevertheless volunteered to go into the office and check the signal from their end. Virgin Media management should take note - that was above and beyond the call of duty - it's committed people who care that make the difference between lousy base standard and decent service. A little later Jacob called from the office and said he was on the system and noted the network was effectively unusable in the area. Though a signal was just about reaching my modem it wasn't going to be any good for anything and it was the same across the district. So he had called the chief network engineer, Mark, into the picture and was asking that he do what he can to fix the problem. The connection was down all day but thankfully is back this morning. When I checked the automated recording service fault line later in the evening, the official line was that customers with Ntlworld email accounts were experiencing problems but engineers were working to sort out the issue as soon as they could. The Corrigan clann are back in the land of the internet for now. I'm not sure for how long this time. But thank you to the front end Virgin Media techies who did eventually get to the bottom of and rectify the network failings and kudos especially to Jacob for going that extra mile and more on your day off. Update: 12.15pm on day we got connection back. Connectivity down to a crawl again. Annoyed! Update 2: 1.30pm on day we got connection back. Connectivity seemingly ok again. Wireless connectivity usable but erratic in the evening. Update 3: Monday am and early afternoon - connection down/dodgy.